NECKLACE- SARAH COVENTRY. "MERRY-GO-ROUND" FROM 1956. 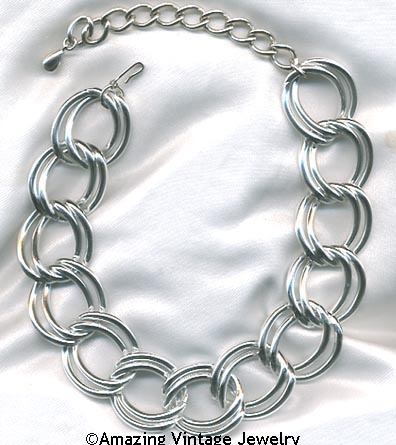 BRIGHT SILVERTONE WIDE DOUBLE LINKS - JUST STUNNING!!! ADJUSTABLE UP TO 16" LONG, 1 1/8" WIDE. FAIR CONDITION - THERE ARE SOME CHIPS TO THE METAL AND A LOT OF WEAR WHERE THE LINKS RUB AGAINST EACH OTHER. NOT MARKED.